KLA is hiring innovative, intentional, reflective teachers that are inspired in the world-renowned Reggio Emilia philosophy. 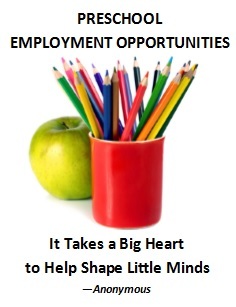 This excellent career opportunity is perfect for energetic, creative and enthusiastic specialists in Early Childhood Education who have a passion for teaching and enriching the lives of children. Part-time and full-time positions are available. Please include a cover letter, resume and transcripts (unofficial acceptable) that reflect completed courses in ECE/Child Development.